David and Kristen were a fun couple. I loved how down to earth they were with planning their wedding! I remember the first time I got off the phone with her, she said she wanted to use the color pink and I said, “that’s hot! I love that color it’s very bright which means you will get your moneys worth on color saturation”. She later told me that one of the reasons why she booked with Encore was because I used the word “hot”. 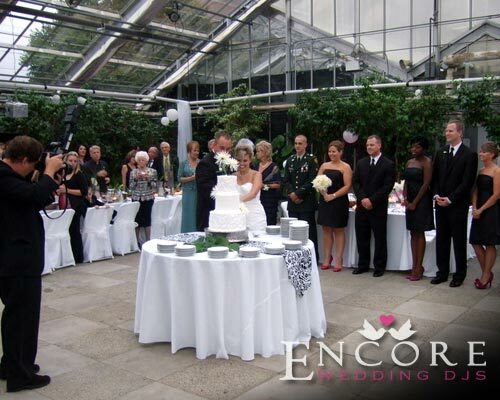 Their reception and ceremony was held outside in the Horticultural Gardens at Michigan State University. Vendors BEWARE, this place is next to impossible to find. I came to the correct address to end up at the wrong reception?! Parked on the other side of campus. I could see it, but not figure out how to access the place. I almost swam across the river (I think it was a river) to get to the gardens. Thankfully we always arrive with plenty of time to setup! There was a light chance of rain, and the couple lucked out. The sky opened up right after the ceremony ended. I had to put away the mixer and cables quickly so I wouldn’t melt. Now onto the reception, besides providing the DJ entertainment Encore was also hired for the lighting. We light up the trees and interior landscaping to give a classic outdoor vibe. And to fit with the theme, even Kristen’s dress/veil had a retro feel with a modern twist. Thanks again for inviting us to your special day!